Monday, September 16 was a meaningful day for me. It was my official graduation ceremony in Paris. Unfortunately, I couldn’t attend my ceremony so I was happy to celebrate in my own way in Shanghai. One of my closest friends hosted me in Shanghai and I was so happy to spend time with her. We decided to have an early dinner at Jean Georges’ Nougatine (3 on the Bund). I had eaten at Jean Georges’ signature restaurant before, but I didn’t realize they changed their “bar lounge” into a upscale bistro. What was even better is that from 6 to 7pm, Nougatine serves a special Early Bird menu. For 218 RMB, you get a three-course dinner, which is totally worth it. The food they serve on the Early Bird menu is similar to what you would get at the Jean Georges signature restaurant. I started my meal with the foie gras brûleé, which was a thick piece of foie gras served on top of a small slice of bread with sour cherries and candied pistachios. It is one of my favorite dishes at Jean Georges because the combination goes so well together. It was served with a slightly sour gelée that cuts the fattiness of the foie gras. My friend ordered the shrimp salad, which was quite large, and served with mushroom slices, tomatoes and a lovely champagne vinaigrette. For our main course, we both ordered the salmon, which came with a passionfruit emulsion, spinach and black olives. It was my first time having salmon served with a fruity sauce and it worked surprisingly well. We ended our meal with the best mouelleux au chocolat on the planet. It’s a warm molten chocolate lava cake served with a scoop of vanilla ice cream. To this day, I don’t think I’ve ever had a better mouelleux au chocolat. 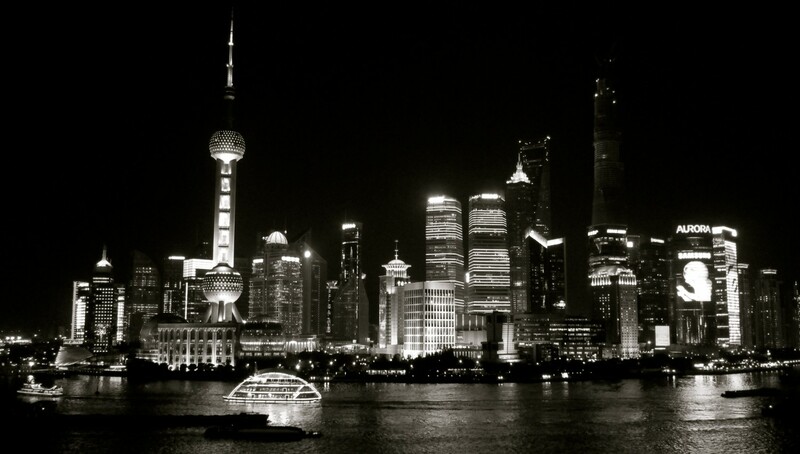 It was a gorgeous night in Shanghai. After our dinner, we took a walk on the Bund and enjoyed the beautiful view of Pudong. Every time I come to Shanghai, I feel like they add more and more lights to Pudong and I kept hearing Rihanna’s “Diamonds” in my head (shine bright like a diamond). The next day I visited Tian Zi Fang (田子坊), located in the French Concession. Tian Zi Fang is one of my favorite “tourist spots” and holds a dear place in my heart. It’s a small enclave, which has kept its original 1930s architecture, but it now houses cute boutique stores, art exhibitions and restaurants sprinkled throughout its alleyways. I still remember when Tian Zi Fang first opened in 2006. I thought it has so much charm. Today, it is much more touristy, but I still think it is worth a visit and is much more interesting compared to Xin Tian Di (新天地). It was a short but wonderful trip to Shanghai. Only three people (including myself) didn’t attend graduation, so I was definitely feeling nostalgic seeing everyone’s photos. I’m glad I was still able to celebrate this momentous occasion with a dear friend in a beautiful city.